HELLBOY (4 out of 10) Directed by Neil Marshall; Screenplay by Andrew Cosby; Starring David Harbour, Milla Jovovich, Sasha Lane, Daniel Dae Kim, and Ian McShane; Rated R for strong bloody violence throughout, and language; Running time 120 minutes; In wide release April 12, 2019. I got about halfway through this article and lost it to the underworld as I did not click 'save' and honestly it's an accurate reflection of my feelings about Hellboy. Not going to lie, I forgot this movie was coming out. Aside from a few golden tweets about it, it flew under my radar until I went to the theater that day to see Shazam! so...not great. The opening sequence tries to set the scene of what would be an excellent, metal movie with immediate gore and swears. Ian McShane introduces the history of the soon-to-be villain, The Blood Queen (Milla Jovovich), and her downfall thanks to King Arthur and Excalibur (which surprisingly doesn't exist just to be history garnish as King Arthur usually is). And that's where any sort of "epic" and "metal" movie stops. 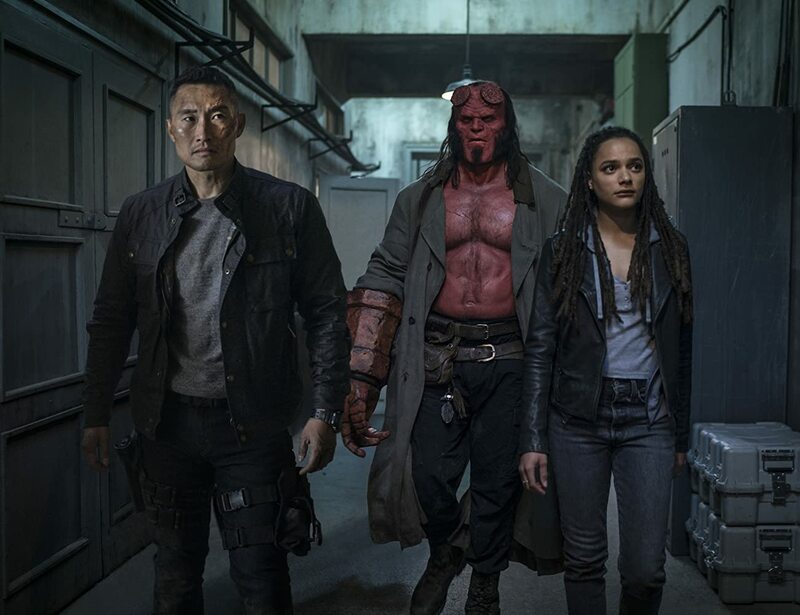 After that opening scene, Hellboy gets stuck in a reboot rut, suffering in the shadow of it's magnifcient older and much cooler brothers. Hellboy (David Harbour) is introduced in a scene created to show us that our scary protagonist does have the capacity to care about people? I guess? 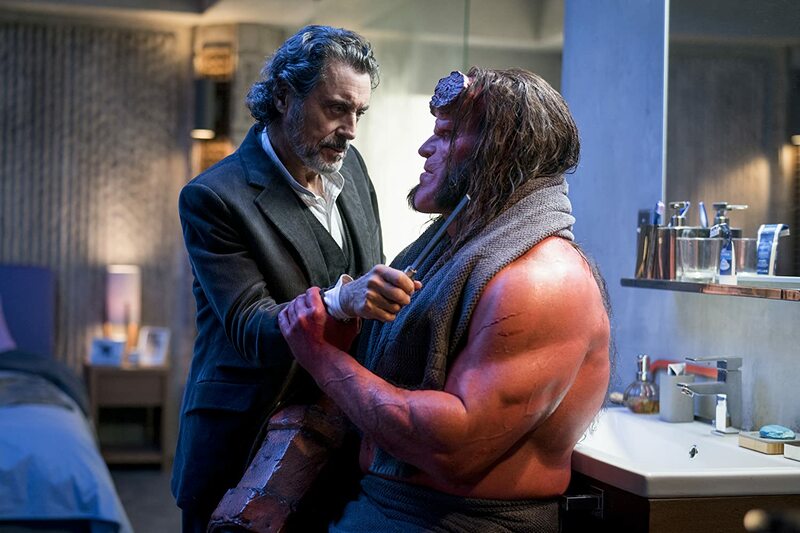 Hellboy's dad (Ian McShane) plays an important role in Hellboy's life, dictating his actions and guiding Hellboy's angst through different missions of their paranormal agency, and while it's obvious their relationship is important, strained, and full of secrets...we don't care. McShane yells real good, but beyond that, the father/son relationship falls flat. Hellboy has some additional features that make you wish for a third installment from Guillermo del Toro. The Babayaga, a nightmarish and limber woman, makes an appearance in her home-prison on bird legs. She exists in this film as a reminder that del Toro does not have a monopoly on creepy things and to set up a potential sequel. The Blood Queen's subject that works to piece her back together is an overly animated pigman that is more cute and annoying than overtly threatening. On top of the mishmash of scenery and underwhelming action sequences is such an incredible soundtrack that goes to waste. Muse, Black Rebel Motorcycle Club, Alice Cooper, Motley Crue, even a Spanish version of "Rock You Like A Hurricane", all wasted. Also wasted? A cameo appearance by Thomas Haden Church that has you saying, "is that...Thomas Haden Church under there?" How does it compare to the original source material, the comic created by Mike Mignola? I'm not an expert in the subject but based on my brief reads, comic-Hellboy is layered and someone that you actually care about. Harbour's portrayal is insanely stiff and feels more like an impression of Hellboy rather than an embodiment. Sasha Lane's performance tries to make up for the blandness of Harbour's, and Daniel Dae Kim is there too as more of a deus ex machina instead of a compelling character. If you like gore and a strange mix of a soundtrack, go and get your demon on. Otherwise, you're better off rewatching Ron Perlman's portrayals.